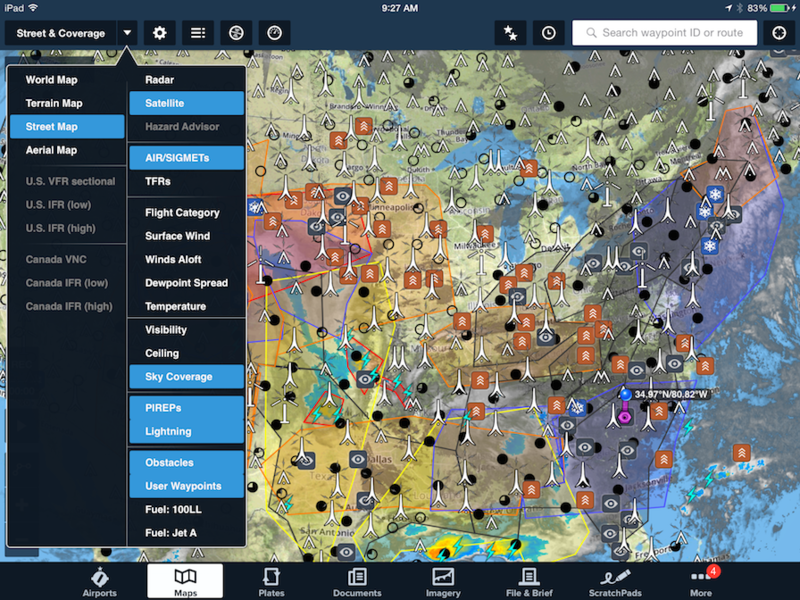 In addition to all of the other great features introduced in ForeFlight Mobile 6.8, we also enhanced the app to allow more layers to be displayed simultaneously on the Map view. Many of these layers are mutually exclusive of one another. That is, when you select a new layer, it will replace the current layer (if any) that was previously selected. For instance, the app will not allow the Radar and Satellite layer to be displayed at the same time. Therefore, with the Radar layer on, selecting the Satellite layer will deselect and hide Radar layer. Having this dependency certainly makes sense when selecting between many of the airport-specific layers such as Flight Category, Temperature and Ceiling just to name a few. That dependency hasn’t changed. However, the Pilot Weather Reports (PIREPs) and Lightning layers are not tied to an airport and can now be overlaid individually or together with any of the other Map layers. When viewing the Satellite layer, be sure to select Sky Coverage, PIREPs and Lightning for the most complete picture. This was primarily done to allow users to select the satellite layer while also displaying Sky Coverage along with Lightning as discussed in this earlier blog post. Adding on the PIREPs layer will provide an even greater situational awareness of the weather occurring at any particular location as shown above. If you were to visit the Aviation Weather Center in Kansas City, Missouri, you will notice on the image below that they also make heavy use of overlays. 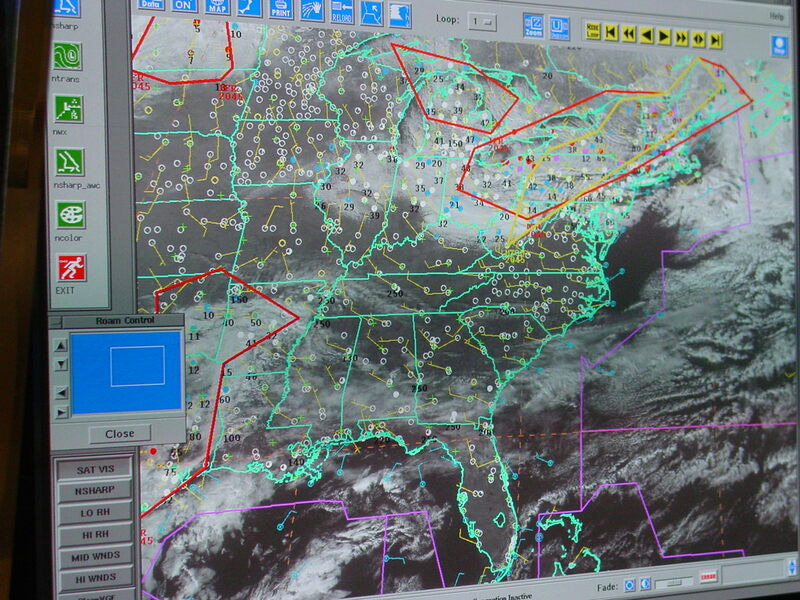 Forecasters often overlay sky coverage and AIRMETs over the visible satellite image. But if you really want to go crazy, you can select up to seven layers to be displayed at the same time as shown below. But let’s not go crazy. Adding too many layers can render the Map view unreadable. 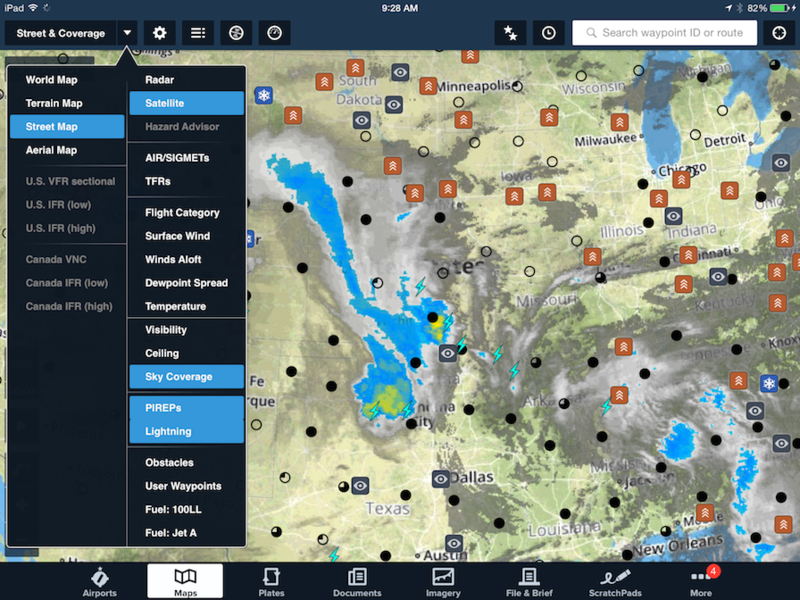 This entry was posted in Weather and tagged foreflight, iPad, Weather by Scott Dennstaedt. Bookmark the permalink.